FAQ: What tanks do you recommend for heavy crude oil on a tank farm? Question: I need flexible tanks for tank farm. Have you have products for the storage of heavy crude oil? Storage of Heavy Crude Oil in tank farm. Answer: Thank you for contacting us! Flexible tanks can be used for the storage of crude oil, fuel and more. Our flexible tanks are extremely versatile and have often been adapted to meet various storage requirements or tank fittings needs. By providing us with additional information (such as the size of the tank you require) our sales team can work to best assist you with your needs. Flexible tanks are used in a wide range of applications and are built with materials that specifically meet the liquid you intend to store. In addition, tanks are often placed in the Tank Farm Setup that you mentioned. This allows customers to store several gallons of liquid in the same location. Standard fittings used for the collapsible tank measure from 3/4" to 2", however we often supply larger fittings to match your requirements (such as units that measure 4" to 6"). Fitting materials typically include aluminum, stainless steel, and polypropylene with camlock, storz or threaded fittings to match hoses. Tanks are also supplied standard with ball valves, pressure relief vents, and caps. We also frequently equip these tanks with fittings that are designed specifically for your site location including ports (floor or drain) for fast cleaning, pressure relief valves, emergency plugs, repair kits, and operational spare parts. 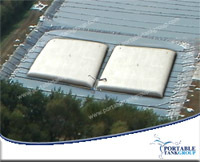 For more information, please review our Pillow Tank page. Flexible tanks can be made in capacities up to 210,000 gallons, with slightly larger tanks up to 250,000 gallons available upon request.